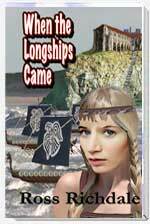 When the Longships Came is still one of our most popular ebooks this year. One other survivor, postulant Jolene finds her and together they return to the monastery. Secrets are discovered that both help and hinder, including secret tunnels, a mine and evidence of clandestine trading with Vikings. Refugees from an nearby village are welcomed but Kendra is raped by one of the villagers and finds her feelings confused. A knight from the King’s army arrives but is as ruthless as the Vikings. He is driven from Bramingham but places the monastery under siege. With winter coming there is every chance that they will be starved into submission. One night, Kendra awakens to see a Viking standing by her bed. He is Rodmaf who tells her she is the daughter of Thorodd, a dying Viking chieftain who wants to see her before he dies. Under threat of having her friends killed, she agrees to accompany him back to his homeland. At the Viking village of Brodsted Kendra meets Hendrix, Thorodd’s wife and the old man who is her father. She learns that her mother died giving birth to her and that Rodmaf is her half-brother. Thorodd dies and a terrified Hendrix tells her that they must leave otherwise they will be sacrificed at Thorodd’s funeral. They escape in a small longship but the journey back is wrought with danger. In stormy conditions, they arrive at Bramingham and are rescued before their longship is crashes into the northern cliffs. Rodmaf’s fleet arrives and attacks the king’s army who are no match for the battle hardened Vikings and are defeated. The siege is over, the Vikings leave and they approach winter with enough supplies to see them through. But what will happen, come spring with a massive Viking invasion fleet expected?